ABSTRACT. Studies of drill cores from the Pasos Blancos area at El Laco in the central Andes, northern Chile, give evidence of an intense and extensive subvolcanic contact-metasomatic process. This process resulted from shallow-level emplacement of very volatile-rich iron-oxide magma, with discharge of volatiles that resulted in extensive fracturing of overlying volcanic rocks. The brecciated rocks were altered (mainly extensive scapolitization and formation of pyroxene) by hot magmatic fluids emitted from the cooling intrusion , and accompanied by magnetite deposition. With time and decreasing temperature, the metasomatic fluids evolved to fluids of hydrothermal character, and a final recent geothermal event took place that deposited superficial gypsum over a large part of the El Laco Volcanic Complex. Keywords: Contact metasomatism, Iron oxide magmas, El Laco, Northern Chile, Andes. RESUMEN. Estudios realizados en testigos de sondajes en el area de Pasos Blancos en El Laco, en los Andes Centrales del norte de Chile, dan evidencias de un intenso y extenso proceso subvolcánico de metasomatismo de contacto. Este proceso es el resultado de un emplazamiento a poca profundidad de un magma de óxido de fierro muy rico en volátiles y cuya descarga de gases produjo un intenso fracturamiento de las rocas sobrepuestas. Las rocas brechizadas fueron alteradas (principalmente una extensa escapolitización y formación de piroxeno), junto con la depositación de magnetita, por los fluidos magmáticos calientes emitidos por la intrusión durante su enfriamiento. Los fluidos metasomáticos evolucionaron en el tiempo y con la disminución de temperatura, a fluidos de carácter hidrotermal y finalmente tuvo lugar un evento geotérmico reciente, el cual depositó yeso superficial en gran parte del Complejo Volcánico El Laco. Palabras clave: Metasomatismo de contacto, Magmas de óxido de fierro, El Laco, Norte de Chile, Andes. Since their discovery in the early 1960's (Park. 1961), the iron-oxide ore bodies at El Laco have been suggested to have formed from a volatile-rich iron-rich magma which intruded a Plio-Pleistocene volcanic complex at shallow depth and at places erupted onto the surface (Naslund et al., 2002, and references therein; Henríquez et al., 2003, 2004; Naranjo et al., 2004; Nystróm et al., 2008). However, a hydrothermal origin has also been proposed for the El Laco orebodies (Larson, 1994; Rhodes and Oreskes, 1994, 1995, 1999; Oreskes et al., 1994; Rhodes et al., 1999; Sillitoe and Burrows, 2002; Sillitoe, 2003). The owner of the iron deposits, Compañía Minera del Pacífico (CMP), has carried out an extensive program of drilling at El Laco in recent years (2007-2008). This program has included ca. 3,310 m of drill core, with one drill hole attaining a máximum depth of approximately 500 m in the Pasos Blancos area where no iron ore crops out (Fig. 1). The purpose of this work is to document new geological features at depth within this area, which give new information about the evolution of this unique volcanic complex. 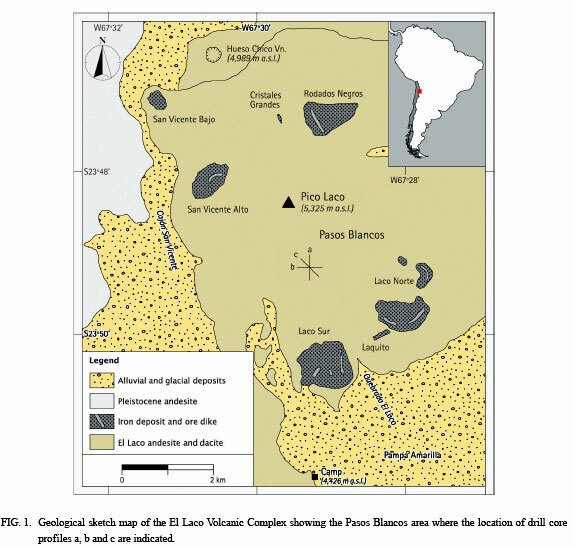 The El Laco Volcanic Complex (ELVC) in the central Andes is a Plio-Pleistocene cluster of andesitic to dacitic volcanic structures comprising seven or more minor stratovolcanoes and domes at altitudes of 4,600-5,200 m a.s.l. Some of these volcanic sour-ces, which are distributed within an area of 30 km2, have erupted iron oxide as lavas and pyroclasts (e.g., Henríquez et al., 2004). The iron-oxide volcanics are largely composed of magnetite except in surface outcrops of major deposits that resemble lava flows, where hematite formed by martitization of magnetite predominates. Othermineralspresent are f luorapatite and pyroxene, typically in minor-trace amounts. These volcanic producís most probably evolved independently from a common magmatic chamber, based on the magnetic modelling by Alva et al. 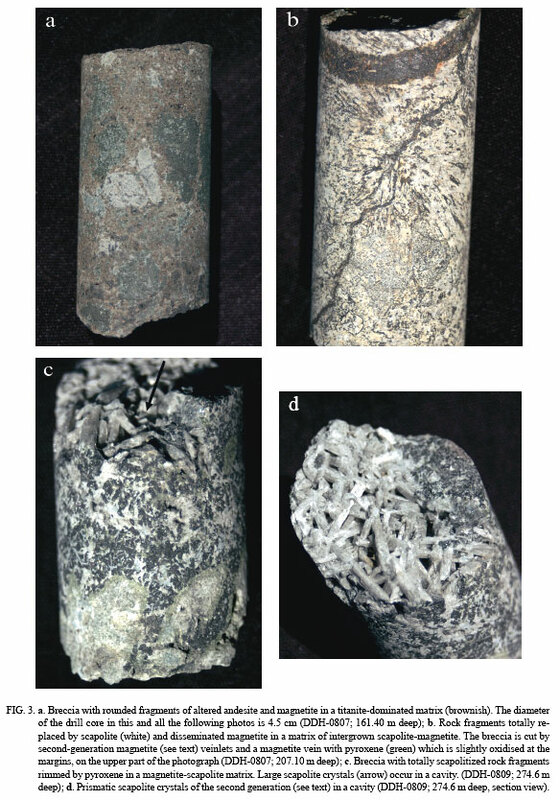 (2003) that inferred the presence of a large magnetite body at depth in the Pasos Blancos area. Iron-oxide lava flows and pyroclastic density current deposits are found at many places in the ELVC. Lava flows, domes and pyroclastics of andesitic-dacitic composition were erupted from central craters of the stratocones. Iron-oxide lavas and pyroclastics, on the other hand, appear to have been erupted from independent parasitic vents, mostly fissures. The iron-oxide bodies occur interf ingered with the andesitic volcanic producís. 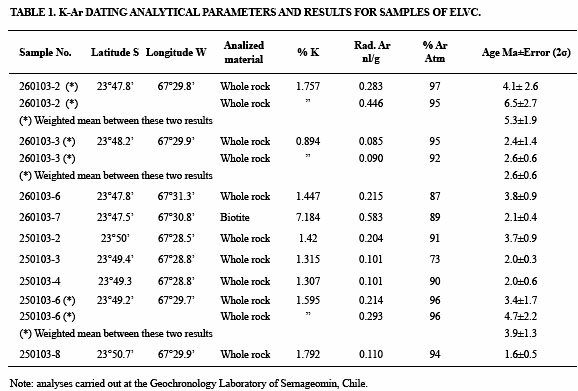 K-Ar dating carried out at the laboratories of the Servicio Nacional de Geología y Minería (Sernageomin) of nine samples of andesite lavas and sub-volcanic rocks from different structures in the ELVC have given ages of between 5.3 and 1.6 Ma (Table 1). Structures in silicate lavas interpreted as ice-contact features were attributed to Upper Pliocene glaciations (Naranjo et al., 2008). These ages are in agreement with fission-track dating of apatite from the iron-oxide ore (2.1±0.1 Ma; Maksaev et al., 1988) and previous K-Ar dating of andesite lava (2.0±0.3 Ma; Gardeweg and Ramírez, 1985). Extensive late Pleistocene moraine deposits crop out immediately to the west of El Laco. They were produced by glacier tongues that affected both the ELVC and the Pleistocene Puntas Negras volcano further west. Hammerschmidt et al. 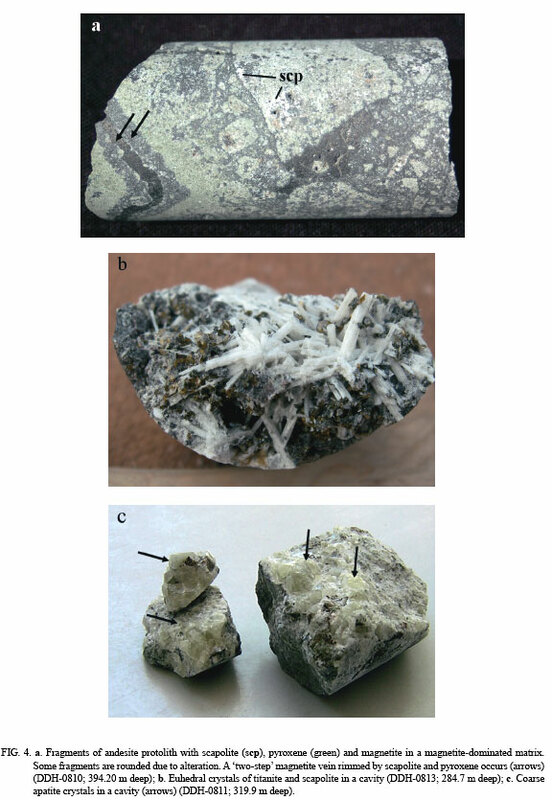 (1999) deter-mined He and Ne cosmogenic ages in pyroxene crystals obtained from ice-polished lava surfaces at El Laco and reported values of 226 and 287 ka, respectively. Consequently, nonglacial erosional rates in the ELVC area are low. Drilling in the Pasos Blancos area in 2007 and 2008 yielded a total of 3,310 m of drill core. Ten holes with a máximum vertical depth of 444.35 m (one 500.5 m long core is from a 60° oblique hole) were drilled in a one by one kilometer area (Fig. 1). Drill cores were logged, sampled and photographed. Representative samples were analyzed by XRD at Sernageomin and the Swedish Museum of Natural History, and polished thin sections were studied in order to determine the mineralogy and textures. The rocks in all the drill cores are breccias with some well-preserved fragments of andesite and rare dacite protoliths, as well as fragments of magnetite. However, some, or most, of the original minerals of the rock fragments are commonly replaced by other phases. The breccia matrix consists of magnetite, scapolite and pyroxene (diopside) (Fig. 2a). The intensity of the alteration increases with depth. At higher levels the rock fragments are angular, and have reaction rims composed of scapolite and less pyroxene (Figs. 2b and 2c). At depth the fragments are strongly replaced by scapolite and some pyroxene (Fig. 2d). Fragments that are totally replaced tend to have rounded shapes due to metasomatic reactions. Magnetite is abundant at depth in most drill cores. Gypsum oceurs in veins and open spaces and repre-sents the last stage in the alteration process. Magnetite. Magnetite is abundant in the lower parts of most of the drill cores. It oceurs as veins and vein-lets in the breccias, as breccia fragments (Fig. 3 a), and as disseminations in the matrix of breccias and rock fragments. Three generations of magnetite are recognized. The first is represented by brecciated massive magnetite fragments and veins. In almost unaltered andesite it also oceurs as grains and inclusions in plagioclase phenocrysts, both with rims of tiny plagioclase crystals with the appearance of microlites. The second generation is represented by magnetite veins and veinlets that cut the breccias, and have a hematite oxidation halo associated with a rim of scapolite and pyroxene (Fig. 3b). The third generation corresponds to pyrite-bearing magnetite veinlets that cross-cut all previously formed phases. Scapolite. Two generations of scapolite are recognized. The first is represented by the partial to complete replacement of plagioclase phenocrysts and groundmass in rock fragments by scapolite (Fig. 3b). The mineral forms conspicuous reaction halos in partly altered breccias (Fig. 2c). Scapolite is also a major constituent of the breccia matrix (Figs. 2a and 3c). This scapolite occurs as up to millimeter-sized, prismatic, white-translucent crystals. 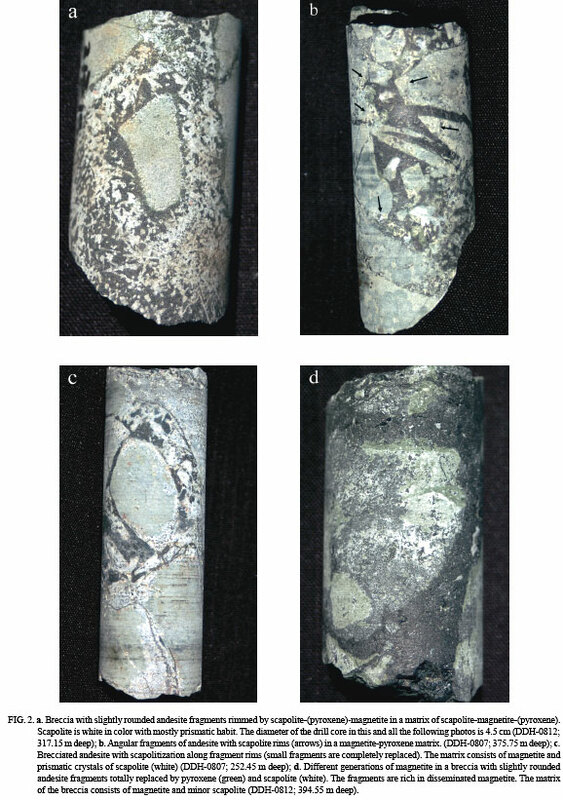 It is marialite according to electrón mi-croprobe analyses of samples from an old drill core at Pasos Blancos. The second generation of scapolite is represented by aggregates of up to 3 cm long prismatic crystals in open spaces (Fig. 3d). Pyroxene. Well-formed, up to 1 mm green crystals of pyroxene typically showing mosaic texture. The mineral occurs in the matrix of the breccias and rock fragments, and as reaction halos around fragments. Pyroxene is also found as rims of mag-netite veins that cut breccia fragments and matrix (Figs. 2d and 4a). Titanite. Some titanite is present as euhedral crystals associated with scapolite in open spaces (Fig. 4b). The mineral also occurs in the breccia matrix (Fig. 3a). Natrolite. Natrolite occurs as pink needle-shaped (up to 5 mm) and microgranular crystals in open spaces. Garnet. Up to 2 mm-size crystals of garnet are disseminated in the breccia matrix. In an old drill core from Pasos Blancos, the garnet has been de-termined to be Ti-bearing andradite-grossularite (microprobe analysis). Apatite. Submillimeter-sized crystals of apatite can be observed in andesite fragments. Apatite occurs less commonly as up to 1-2 cm long, euhedral crystals of palé yellow-green color in open spaces (Fig. 4c). Chemically and supportedby XRD, the mineral is fluorapatite. Pyrite. Pyrite is associated with magnetite veinlets of the second generation, and occurs disseminated in the matrix of breccias as well as rock fragments. Microscopic veinlets of pyrite cut magnetite. Chalcopyrite. Although very scarce, some grains of chalcopyrite are observed disseminated in the matrix of breccias. Mica. A mica mineral with weak pleochroism in transmitted light, indicating a low iron content, is observed in thin sections. It is probably phlogopitic mica because such a phase has been observed in an old drill core from Pasos Blancos and elsewhere at El Laco (Rodados Negros). According to microprobe analyses this mica is very rich in fluorine (5-7 wt% F) and poor in chlorine. Based on the relative abundances of scapolite and pyroxene, the presence of totally replaced rounded fragments versus angular less altered fragments of andesite, and the presence or absence of reaction rims, the following units were defined during drill core logging: hydrothermal breccia; andesite with an imprint of low-intensity contact metasomatism, breccia with high-intensity contact metasomatism. and breccia with high-intensity contact metasomatism and iron-oxide mineralization. These units are shown in schematic drill core profiles in figure 5. 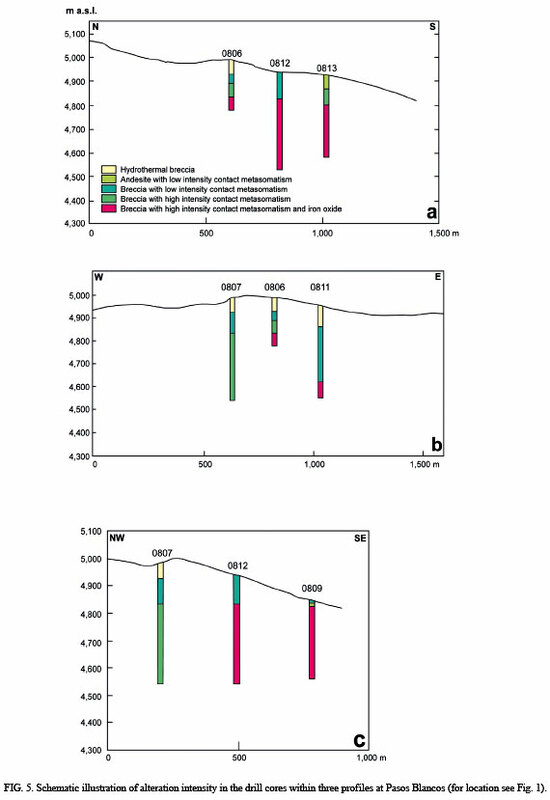 Study of the drill cores from Pasos Blancos allows the identification of four stages during the contact metasomatic-hydrothermal alteration process at El Laco. 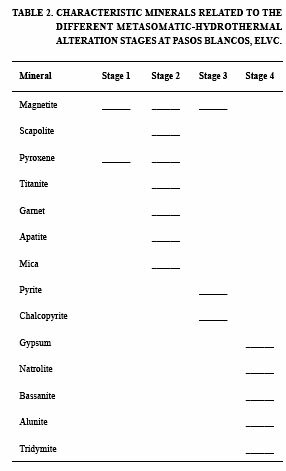 Their characteristic mineralogies are summarized in table 2. The first stage is characterized by formation of breccias and dikes/veins of magnetite, with crystallization of magnetite in the matrix, and magnetite with microlitic plagioclase rims in andesite. Magnetite is ubiquitous in drill cores from all levels. The magmatic character of the magnetite of this stage is inferred from features similar to those found in magnetite dikes that crop out at Laquito and Laco Sur (Fig. 1) (Henríquez et al., 2004). The similar features include sharp ore-rock contacts and an equigranular texture of the magnetite. A magmatic origin is supported by the existence of microlitic plagioclase rims in well-preserved andesite host rocks. The second stage is interpreted as an episode of contact metasomatism caused by the intrusion of an iron-oxide magma at a subvolcanic level. The stage is characterized by development of magnetite veinlets with halos of hematite due to oxidation, and intense scapolitization. Pyroxene and subordinate garnet, titanite, apatite and mica were also formed. At depth, the alteration resulted in almost complete replacement of the andesite (-dacite) clasts with formation of scapolite-magnetite rock (Fig. 3b). The effects of the metasomatism decrease towards the surface, where it is visible as reaction rims. The third stage is of hydrothermal character and its effects are present mainly in the uppermost parts of the drill cores. They include pyrite-bearing magnetite veins and veinlets, pyrite dissemination in the breccia matrix and andesite fragments, and microscopic veinlets of pyrite cutting magnetite. The scarce chalcopyrite disseminated inthe breccia matrix also belongs to this stage. The fourth stage is interpreted as a hydrothermal-geothermal process that represents the last alteration event. It is characterized by abundant gypsum filling open spaces mainly within the breccia matrix. Other minerals associated with this stage are natrolite, bassanite, alunite and tridymite. The presence of steam vents and hot springs where magnetite had been oxidized to hematite, together with deposition of sulphur, gypsum, white clay minerals and possibly alunite, may reveal that this stage is still active. Our genetic model for the alteration in the Pasos Blancos drill cores and its relationship to the iron-oxide deposits at El Laco is as follows. Shallow-level emplacement of volatile-rich iron-oxide magma, with discharge of volatiles which resulted in extensive fracturing of overlying vol-canic rocks in the ELVC. intrusion of volatile-rich magma and consequent fracturing greatly increased the permeability of the host rock (Meinert et al., 2005). The brecciated rocks were altered (mainly extensive scapolitization and formation of pyroxene) by hot magmatic fluids emitted from the cooling intrusion , and magnetite was deposited. The role of hot metasomatic fluids is supported by the existence of very F-rich mica. With time and decreasing temperature, the metasomatic fluids evolved to fluids of more hydrothermal character, and a final recent geothermal event took place that deposited superficial gypsum over a large part of the ELVC. This interpretation is in agreement with magnetic modelling by Alva et al. (2003) that inferred the presence of a large magnetite-bearing body at depth in the Pasos Blancos area. The textural and mineralogical features described here for the altered volcanic rocks at El Laco differ from corresponding features and protoliths reported for iron skarns in the literature (Meinert et al., 2005) and they are similar to those present at Kirunavaara (Romer et al., 1994) and Olympic Dam (Roberts and Hudson, 1983). The estimated thickness of the volcanic sequence affected by the metasomatic process at Pasos Blancos is at least 450 m (Fig. 5), which corresponds to a great volume of rock. This requires a sizeable source of heat and volatiles. We suggest that this source was the emplacement of iron-oxide magma that is postulated to form a large intrusive body at depth below Pasos Blancos. A contact-metasomatic process affecting a >450 m thick pile of volcanic rocks in the Pasos Blancos area at El Laco is well def ined in drill cores by the occurrence and distribution of scapolite and pyroxene. As f ar as we know, this kind of process has not yet been described associated withyoung volcanism elsewhere. The multi-stage alteration process reported here is proposed to be a characteristic feature associated with shallow-level emplacement of intrusive iron-oxide bodies. Scapolite is a typical characteristic mineral associated with IOCG ore deposits (Williams et al., 2005). The cióse relationship between magnetite-apatite ore and scapolitization at El Laco, together with the presence of chalcopyrite inthe hydrothermal phase, indicates a genetic link between these ore types, both possibly derived from iron-oxide magmas (Naslund et al., 2002). The authorization to access the CMP's drill cores were given by colleagues L. Vergara and M. Rojo, managers of the company. Their support is highly appreciated by the authors. Valuable comments given by the editor, N. Bad-ham, S. Ghandi, T. Spooner and an anonymous reviewer have allowed original manuscript improvement. This is a contribution to the Fondecyt Project N° 1070428. Manuscript received: March 13, 2009; revised/accepted: August 27, 2009.